KARACHI (AFP) – Taliban gunmen armed with rockets and explosives stormed a major naval air base in the heart of Pakistan's biggest city, destroying two US-made surveillance aircraft and killing five personnel. Officials said the brazen attack in Karachi, which came three weeks after the US killing of Osama bin Laden, was continuing eight hours after it began late Sunday when up to 15 militants crept in under cover of night. AFP - Pakistani soldiers enter the PNS Mehran naval air base following an attack by militants in Karachi. Around 10 people were wounded and as dawn spread, fire crews battled to douse towering flames that had risen over the PNS Mehran base, the headquarters of the Pakistani navy's air arm in the teeming port city of Karachi. "A building in the premises is still under their occupation from where they are exchanging fire with our soldiers," Malik told reporters Monday. "The situation is being tackled delicately to secure assets, minimise human losses and defeat the terrorists completely," he said. The Pakistani Taliban, which have stepped up attacks since the May 2 death of bin Laden, claimed responsibility for the Karachi assault. 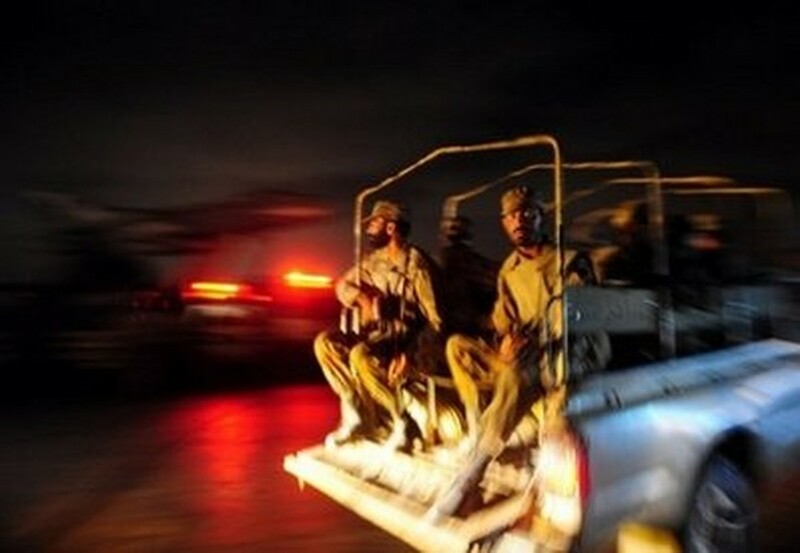 The Al-Qaeda leader was killed by US commandos in a garrison town north of Islamabad, in a raid that humiliated Pakistan's security establishment. The militants' attack deep inside Karachi underlined the military's vulnerability. "They have taken up positions at one place. I hope that soon we will succeed in catching them, dead or alive," navy spokesman Commander Salman Ali told AFP eight hours after the attack began at around 10:45 pm (1745 GMT) on Sunday. An AFP reporter heard several more blasts and gunshots early Monday, as officials said the fire crews had managed to bring a huge fire inside the building under control. Ali said four navy and one paramilitary personnel had been killed in exchanges of fire with the militants, who he said numbered from 10 to 15. "They have destroyed two P-3C Orion aircraft," he added. The United States delivered the two maritime patrol aircraft to PNS Mehran only in June last year. "The attackers first fired rockets," Ali earlier told the ARY television station. "The terrorists also used small bombs and now they are firing with sophisticated weapons. They are inside and still resisting," he said. Home ministry official Sharfuddin Memon from the southern province of Sindh, of which Karachi is the capital, said "more than 10 terrorists" were inside the base and at least 10 people had been wounded. The city has recently seen a spike in attacks on the military. On April 28, four naval personnel and a passing motorcyclist were killed in a bombing, two days after four other people were killed in navy bus bombings. Last week, a Saudi diplomat was shot dead as he drove to the Saudi consulate in Karachi just days after attackers threw grenades at the mission. On Sunday, thousands of people demonstrated in Karachi to demand an immediate end to US missile strikes in Pakistan's northwestern tribal belt on the Afghan border and a block on NATO supplies passing through the country. Despite anger in Pakistan over bin Laden's killing, US President Barack Obama said in a BBC interview broadcast on Sunday that he was ready to order a similar mission if another high-value target was discovered in Pakistan, or anywhere else.